A man named Paul was visiting Athens. While he was in the marketplace, he began to talk with people about Jesus Christ, specifically how Jesus had been crucified and then raised back to life. In 2004, renowned atheist Anthony Flew announced something that was a “strange idea” to the ears of his followers. Flew presented one of his first papers on atheism at the Socratic Club at Magdalen College, where the Christian literary giant C.S. Lewis served as the chairman. Over the years Flew had sharpened his rhetoric to become one of the best known and most outspoken atheists on the worldwide stage. Yet in 2004, an 81-year-old Anthony Flew remarked, “I simply had to go where the evidence led,” as Flew announced to the world: there IS a God. “My discovery of the Divine has been a pilgrimage of reason and not of faith,” wrote Flew in his book There Is A God, which is why last week I shared the first way we can know Jesus is alive in “A” is for apologetics. Today I submit to you the second way one can know that Jesus is A.L.I.V.E. : Lives changed. Paul, who was asked to speak to the philosophers in Athens about his “strange ideas,” had been given the name Saul by his parents. When it came to religion, Saul took a backseat to no one! He was a purebred Israelite from the tribe of Benjamin (which gave Israel its very first king, who was also named Saul). Saul called himself a “Hebrew of Hebrews” because he kept the Law of Moses and the strict rules of the Pharisees absolutely faultlessly. When he heard about Jesus (who claimed to be God), and about the followers of Jesus who claimed He had been resurrected from the dead, Saul persecuted these Christians so vehemently that he not only had many of them thrown into prison, but he had many of them killed as well. That all came to a complete stop when Saul met Jesus for himself! You can read how Saul retold this story in Acts 22:1-16. After this encounter, Saul’s life was 180-degrees different! He even changed his name to Paul to signify his new outlook. Now he was just as adamant to tell people about Jesus as he was previously to harass and persecute Christians. Paul’s conversion came at a steep price. The Jews with whom he used to associate now turned violently against him. Numerous times they attempted to kill him. In addition, Paul’s newfound faith in Jesus caused him to be persecuted by the Romans as well. The Roman Emperors wanted people to say, “Caesar is lord” but Paul and the other Christians were declaring, “Jesus is Lord.” Paul ended up being executed under Emperor Nero. Paul had numerous opportunities to recant, but he never came close to doing so. His life was one that was under constant duress and distress and danger preciously because he refused to back down from his claim that Jesus was alive! Paul isn’t alone. Millions of people around the globe have come to know Jesus as their personal Savior. Many, like Paul, have been harassed for their faith and some even violently persecuted and martyred, and yet they so firmly believed that Jesus is alive that they were willing to go to their early grave with “Jesus is my Lord” still on their lips! What about you? Have you met Jesus for yourself? Check out this video where my friend Scott tells his personal story of how an encounter with Jesus has completely changed the trajectory of his life. 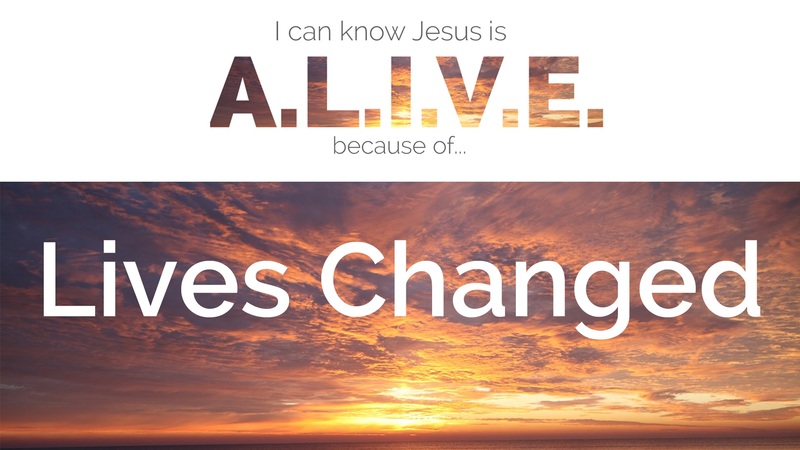 Join me next Sunday as we continue with our 5-part series I can know Jesus is A.L.I.V.E. because of… where we will be looking at the letter “I.” You can join me either in person or on Facebook Live. If you missed the previous lesson, check out “A” is for apologetics by clicking here.